I guess I'm an auditory learner. When I'm walking and listening, things really sink in, become part of me. Yesterday I listened to this fabulous podcast--Evan Kleiman talking about fat shaming and interviewing some experts on myths about health and weight. I started it halfway through my walk, but kept my headphones in after I came home, finding little tasks to do around the house while I finished listening. I love getting hooked like that. One of my pet peeves, though the landscape is definitely changing, is that food bloggers and foodie types either completely ignore the issue of weight and health or or it's all they talk about. And I'm just as guilty half the time! When I post a recipe for biscuits or cookies, I neglect to talk about how those things fit into an overall strategy. Or how my kids will just eat the biscuits and ignore the lentil soup and what's a parent to do? So I have to get a few questions and opinions out of my system every once in awhile. There's a reason (besides lack of willpower or wealth) that fresh fruits and vegetables are hard to eat. And it's because there's a giant food industry whose survival depends on getting Americans to purchase packaged, processed food that are cheap, available everywhere, and full of false health claims. Even those "healthy" snack boxes that I see advertised everywhere--why not eat an apple instead? If you're really trying to eat real food and you travel or work a lot, you know how hard it is to find anything besides carrot sticks. And dry, stubby ones at that! Exercise is a totally separate issue from food. I get outside to stay sane, to keep my muscles, bones, and joints strong. I don't do it to lose weight. In fact, I eat a lot more when I'm exercising! Exercise is a dynamic way I care for my body, but I don't have any expectations that it will decrease my dress size. I used to, but I don't anymore. That took all the fun out of it. And it didn't work. I'm categorically against letting kids choose their own diets. Sure, if all you have around the house are fruits, vegetables, and whole grains, go for it! Otherwise, I don't let my kids choose their own bedtimes. I'm not going to (knowingly) let them smoke or drink. So why would I let them choose their own diets? Of course they will choose sugar and white flour. They're kids! The biggest step is in just NOT STOCKING anything I don't want them to be tempted with. I'm getting closer to that, but I'm just like you--I want my kids to like me. And their meals. If you can't get out of it, get into it. Like I've opined a million times before, get an apron you really like. Find a good way to play music in your kitchen, and organize your things in a way that makes sense. Settle into it and see what happens. It's worth it. P.S. Kumquats. That's what I'm into right now. This morning, I mixed a Greek yogurt with a little honey, then I looked around for what I might top it with. 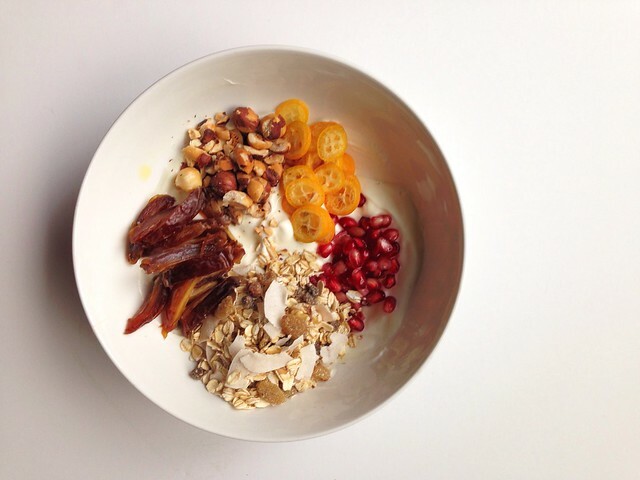 Muesli, kumquats, pomegranates, dates, and hazelnuts.